Ever wondered how convenient it would be if you had an app to order fresh and high-quality farm produce, groceries, and daily essentials? Better still, if these products were delivered right at your doorstep in one hour flat. 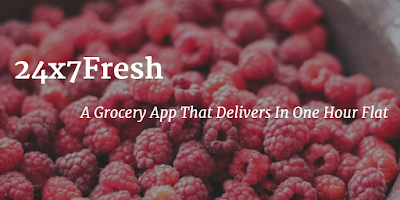 Well, your prayers will soon be answered with the launch of 24x7Fresh, an app based grocery platform that promises to be a quick, convenient, and cost-effective way to distribute produce from farm to your doorstep. Left with bread but no eggs? Craving for this season's Alphonso? 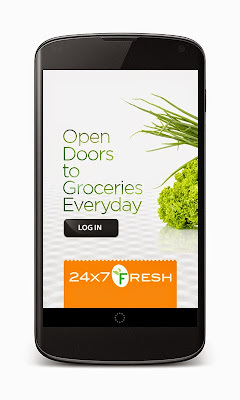 24x7Fresh comes to your rescue each time by offering a wide variety of products. The company houses an inventory of over 15,000 products – ranging from fruits and veggies, meat, and frozen foods - to health, skincare, and beauty products. Co-founded by Randhir Kumar (who also happens to be the CEO of the company), 24x7Fresh aims to assist consumers who want to save both time and money yet have an enjoyable shopping experience. The mobile app will be available on iOS and Android platforms but that's not the only highlight in store. The makers of 24x7Fresh understand that every individual in a family have their own preference of daily essentials and grocery. Keeping their preference in mind, the company is planning to introduce a unique "Social Shopping" feature in the app to identify other family members' orders under a single bill or budget. Based on the Hub and Spoke model, the app leverages GPS enabled transportation optimization systems and Big Data analytics on vehicles' path and traffic that will reduce the transportation costs by nearly 15%. That's not all; with reduction in logistical issues, 24x7Fresh hopes to drive technology and innovation across 30 Indian cities in a matter of mere 6 months. The company is also planning to ramp up hiring in key verticals like technology, marketing, logistics, and customer support. As the competition in online grocery heats up, 24x7Fresh is likely to face off with established players like Amazon's Kirana Now, PepperTap, Grofers, ZopNow, and My24x7Market.com. 24x7Fresh seems like a smart, reliable, and social ecommerce platform that is going to redefine how you look at everyday essentials and home needs.